Our flight from Shanghai to Beijing was on Air China – too bad we didn’t actually bother to order a vegetarian meal ahead of time, because it would have been interesting to see what it would have been! Instead we went to Carre-Four in Shanghai and bought stuff to make sandwiches (roasted pepper and mozzarella, they were good!). 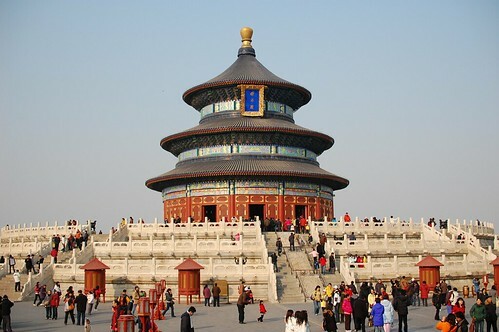 In Beijing we stayed at the Tian An Rega hotel, which was really good – the price was right, there was a rain showerhead, the bed was comfy and the location was awesome next to the Forbidden City…but the temperature was a pretty constant 25-26 C all the time. Not so comfortable for sleeping, and the reception said they couldn’t really do anything about it. That sucked pretty bad. We did somehow manage to get it down to about 24 some nights, but it was uncomfortable. And it was below freezing outside! Since the Chinese New Year festival was still going on there were tons of fireworks! Our first night in Beijing was the fifth night of the festival, which apparently means a LOT of fireworks. 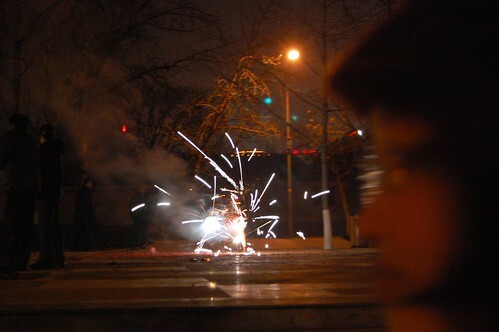 We were just wandering around (looking for a particular vegetarian restaurant which we never found) so we got to see people just setting off fireworks and firecrackers on their neighbourhood streets. Fun, but the noise and smoke got to be a bit much after 45 minutes of pretty much constant celebration! Unfortunately we left our Beijing guidebook in Shanghai in the apartment (oops) so we had a bit of an adventure trying to figure our way around – we ended up buying chapters from Lonely Planet online and putting them on my ipod touch. It worked okay but having a proper map might’ve been useful! We were right next to a big shopping street, Wangfujing – it’s full of different shops, a huge fancy mall, a couple department stores, and lots of people! It was really useful to have such a close landmark – it was easy enough to tell taxi drivers to go there, and then we could just walk. There’s also a Wangfujing metro stop which came in handy! 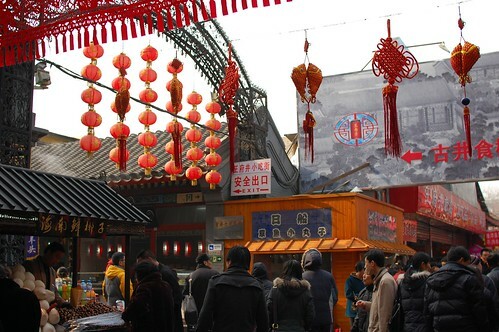 Just off Wangfujing was this snack street, which houses a bunch of food vendors and a couple souvenir shops as well. 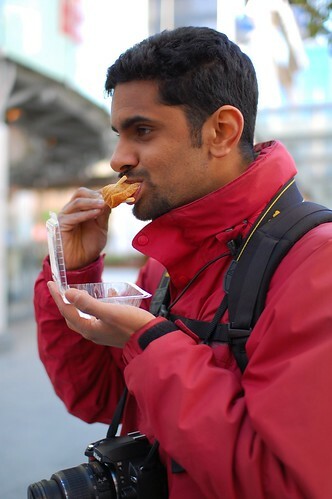 Most of the stuff wasn’t vegetarian, but we did try one that was like a crepe filled with bean sprouts. We walked around Wangfujing a lot, mostly out of necessity – we went to the department store a bunch of times to buy water and snacks, and we found a really tasty dumpling restaurant that actually had veggie options! The second day we headed down for a walk to Temple of Heaven park, which was a bit further than we had thought and quite a boring walk. At least the temple was quite nice. Lots of tourists – again, because people were on holiday. Apparently Beijing empties out a lot during the festival but it still felt pretty populated to us! 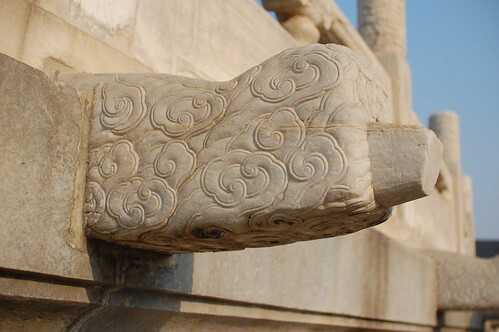 There were even some sheep carved into the marble promenade. At least, I think it’s supposed to be a sheep – what do you all think? 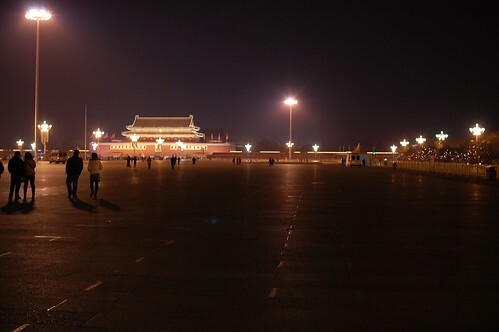 Afterwards we checked out Tiananmen Square briefly before being shepherded out by the police when the square closed. 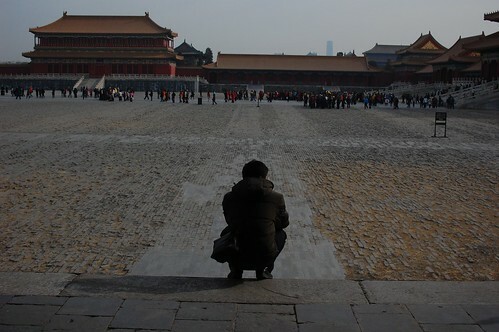 That building on the left (entrance to the Forbidden City) is where that oh-so-famous portrait of Mao is hung. 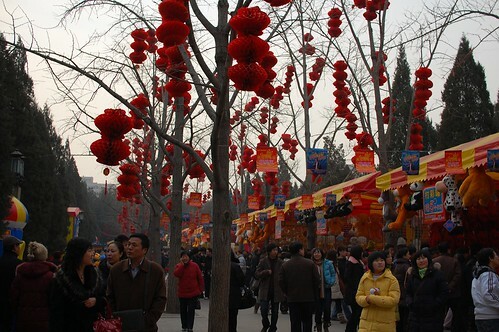 We got a great tip from Elyse of iheartbeijing to check out a temple fair that was going on for Chinese New Year in Ditan Park – it was great! Pretty much all locals celebrating the festival, eating from the many food stalls and playing various midway-style games. There were also some performances going on, and lots of people selling stuff. We met up with Elyse in person afterwards, and she took us to a good veggie restaurant for lunch – unfortunately we didn’t take down the name or take photos or anything! After lunch Elyse helped us book a taxi for the Great Wall (more on that in the next post) and we went to Hou Hai, a manmade lake with restaurants and stuff. 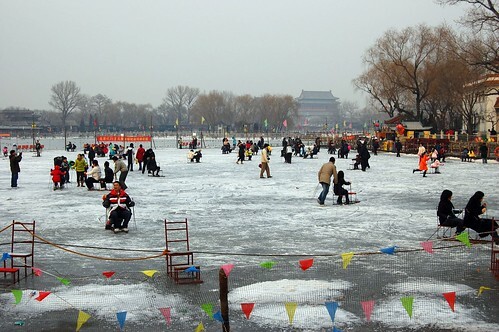 People were playing around on the ice, but mostly without skates – they used metal chairs with ski-type rails on the bottom! 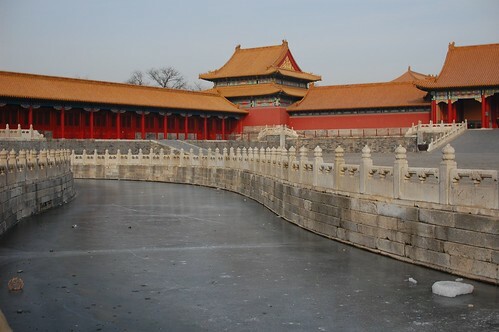 The next day we went to explore the Forbidden City, right next to our hotel – it was huge! Quite a compound with tons of buildings. A bunch of sections were closed off to the public but it was still really cool to explore. As for the veggie food situation, it was a little easier than in Japan. There are Buddhist vegetarians, plus apparently people will just eat veggie for stretches of time as sort of a cleansing or religious thing. So there are lots of veggie restaurants! We found one at the top of the street the hotel was on, just by chance – they had some really nice tofu and veggie dishes, as well as nice tea. It was at the corner of Beiheyan St and Wusi St, if anyone finds that helpful! We also ate at a veggie buffet restaurant near Yonghegong Lama Temple which wasn’t all that great, and kind of expensive compared to other restaurants. All in all, it was definitely doable to find veggie-friendly food. 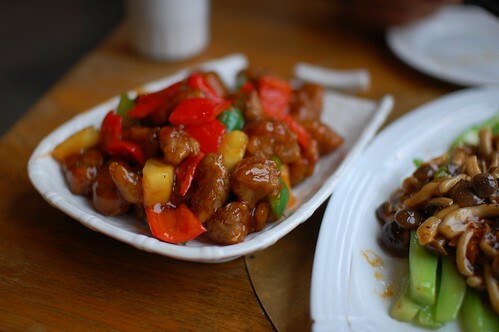 And if we’d been able to speak the language we probably could have ordered veggie dishes in pretty much any restaurant! The Great Wall gets its own post coming up next! Oh, Shanghai. What a weird place. 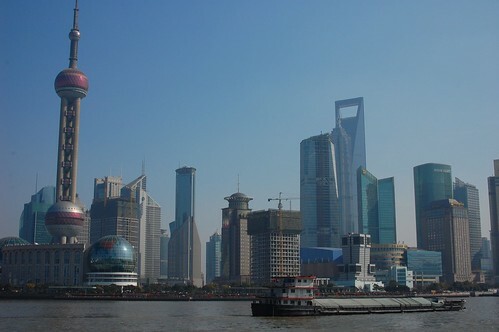 We stayed at my cousin’s place in Shanghai, which is on the east side of the river in an area called Pudong. He wasn’t even in town, so we had it all to ourselves! Big, lovely apartment (with kitchen! and washing machine/dryer!) which made us feel really at home. And there was a great supermarket just down the street. The downside was that it was a little bit harder to get to the other side of town – we had to take a taxi to the metro station, then the metro. And to get back, obviously the reverse! We took a heck a lot of taxis. But they’re really cheap! Our flight from Japan was extremely un-full – probably only about 50 people on a whole 777! It was a really pleasant flight. I really recommend Japan Airlines, the service is great! We landed on Chinese New Year’s day and were bit afraid of crowds travelling and such, but it was actually eerily quiet. I think everyone who was going to travel home for the holiday already did! 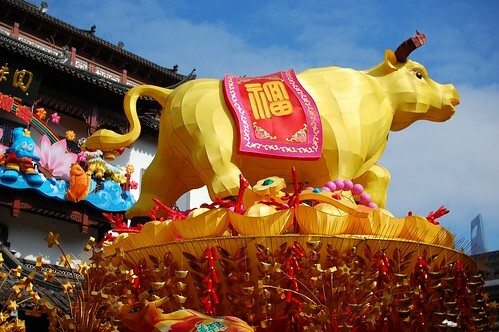 There was a lot of fun stuff going on in China for CNY – lots of decorations, lanterns and such, festivals, and fireworks! The only bad thing was that lots of places were closed or had odd hours over the holiday – I don’t think we had any trouble though. Oh, and there were lots of crowds at stuff because people were off work. The first full day we walked along East Nanjing Road, which is a big shopping/tourist street, then the Bund on the river along to People’s Square. (The Bund is pretty gross. Very dirty, crowded, full of hawkers and not a great view either.) We found a vegetarian restaurant on the first try, which was a good find, but the food was only okay. It turned out that we had a little bit of an easier time finding veggie food in China than Japan because of the strong Buddhist tradition. 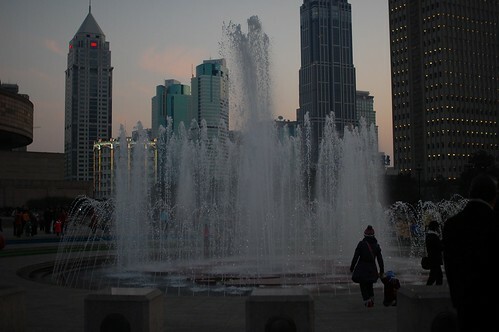 Walked around a bit afterwards around Renmin Park, then we headed home to cook and do laundry! Hooray! The next day we went to Yu Bazaar and walked around lots of little streets with junk shops and tourist wares lining the roads. 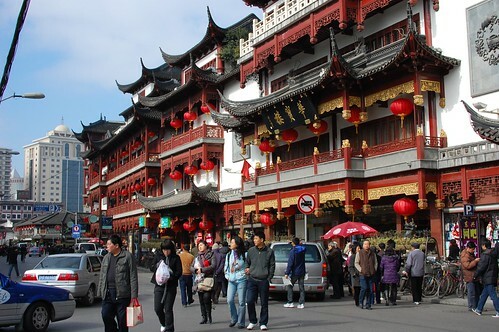 Walking off in a different direction though towards the French Concession, the atmosphere quickly changes and you emerge in a reconstructed traditional area which has become super trendy shops and restaurants. Anyway. 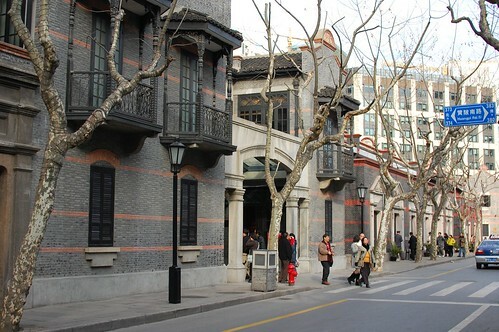 The last day was rainy, so we went to the Urban Planning Museum and the Shanghai Museum. And did more laundry! We also made a return visit to an AWESOME vegetarian restaurant we found the day before, near West Nanjing Road metro station, called Vegetarian Life Style. They don’t use any MSG or much oil – which can be a big hazard in Chinese cooking – and emphasize local and organic ingredients. The picture menu is extensive and easy to order off of! 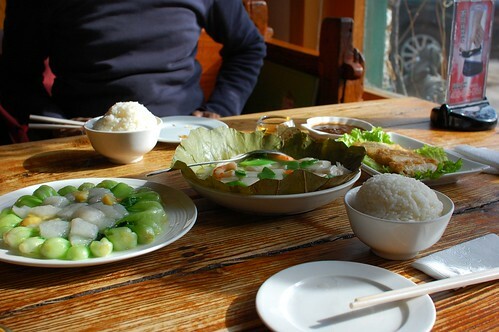 The second time we had some green veg with mushrooms, sweet and sour “pork” and dumplings. Yum yum. Seriously, highly recommended. Conclusions? Shanghai is a weird place. It’s trying to expand and grow and modernize, but it’s trying to do too much, too fast! The entire city is pretty much a construction zone. It’s a very grimy, polluted city as well. First impressions in the taxi from the airport weren’t very good – the buildings look really worn and gross. The pollution has a lot to do with it, finishes on the buildings break down fast and they don’t seem to have been appropriately chosen in the first place. 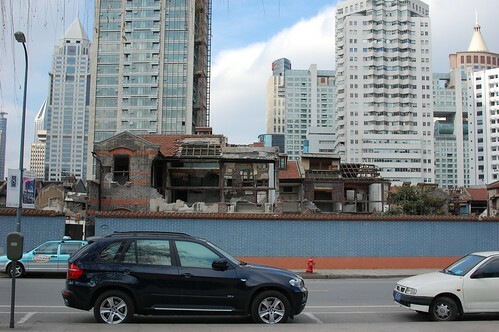 In the city, traditional housing (which hasn’t been kept in shape and was really slums) is being razed and replaced with trendy, expensive condos and office buildings which the inhabitants are shipped out of the area to cookie-cutter government built low income housing. Overall we had an okay experience, Shanghai isn’t my favourite city but it does have some fun…staying in the apartment really elevated the experience since we had somewhere nice to call home! Food was good, the transportation was okay (so many taxis though, we used maps to show the drivers where we wanted to go) but a couple of days of the pollution was more than enough! On the 25th we got up at a reasonable hour and headed out to Kyoto station to head back to Tokyo – we took a different entrance so we stumbled upon a great food stall in the basement somewhere that had lots of onigiri (triangle-shaped rice with filling, wrapped in seaweed) and inari sushi (sweetened tofu sheet with rice inside). Yum yum. I wish I’d learned a little earlier in the trip to ask for konbu (kelp) onigiri! We took the shinkansen back to Tokyo, and even got to see Mt. Fuji from the window! We checked back into the same hotel we stayed in the first time – it was like coming home. 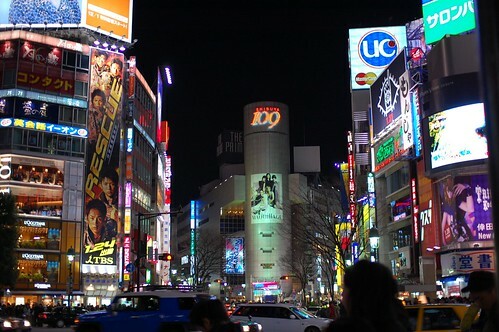 Man, Tokyo was so awesome. After a little rest we decided to do one last sightseeing push for Tokyo – first up was Roppongi Hills, a pretty fancypantsy condo-entertainment complex with a movie theatre, a huge fancy mall, lots of restaurants and such. 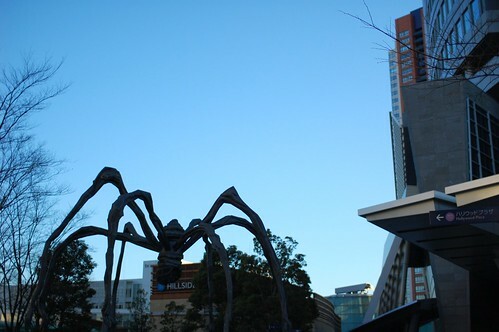 And a huge spider sculpture. To complete our upscale Roppongi experience we had a snack in a local coffee shop, Koots. They had great green tea, slightly weird vegetable-soy soup, and an even weirder cheese-and-olive onigiri! 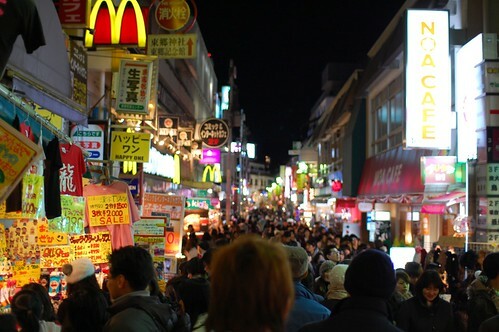 Then it got a little darker and we headed to check out Harajuku – didn’t see too many dressed up people, but there was some good walking around and looking. Lots of crepe shops and clothing shops! From Harajuku we walked along Omotesando street, which has all the designer stores. More fancy stuff! We looked for a restaurant listed online, but didn’t find it. Sort of desperate and hungry, we finally stumbled upon a treasure trove of vegetarian food – a Japanese health food store! I think it was called something like Nature House or something like that. They had a fair amount of prepared veggie Japanese foods in the store, and we picked up some nice oranges to snack on too. I think for food we got some stirfried veggies (beans! glorious green beans! ), some salad, rice, and a tofu dish. One more stop on our way back to the hotel to eat was the intersection at Shibuya station, which is a HUGE scramble intersection. Fun for photos, although a bit tough at night! Back in our hotel we ate up our health food store dinner and packed up for the trip to Shanghai!